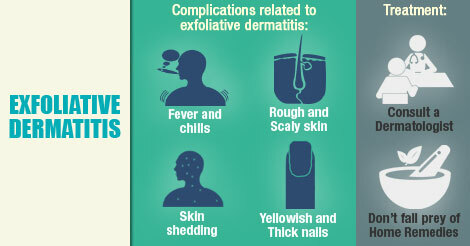 Exfoliative dermatitis in many patients is idiopathic. A condition is termed idiopathic when there is no known cause for it. People with chronic conditions like psoriasis, eczema, autoimmune disorders, and seborrheic dermatitis may develop exfoliative dermatitis. Chronic use of penicillin, barbiturates, sulpha drugs, skin medications, antihypertensive drugs, and anti-seizure drug increases the risk of exfoliative dermatitis. HIV-positive patients and patients having cancers like leukaemia and lymphoma are at high risk of developing this condition. Skin and nail changes: Rough and scaly skin is the first sign of the condition. It is later followed by reddening, itching, and peeling of skin (desquamation) from large areas of the body. Nails become thick, yellowish, scaly, and ridged. Fever and chills: Extensive peeling of skin disrupts in the body’s haemostat and thus causes fever and chills. Severe complications: Skin is made of protein and, therefore, extensive skin shedding leads to protein deficiency in the patient. Also, it affects the production and metabolism of an important carrier protein called albumin leading to a condition called hypoalbuminemia, which is very devastating and can be life threatening. Skin shedding also leads to dehydration which can trigger cardiac failure. Consult a dermatologist for treatment. Please don’t fall prey of various home remedies as under-treatment of the condition can hugely impact your general health and life quality.